South Kinsman Mountain is a 4,358' (683 m) mountain in the Kinsman Range in Franconia, NH, Grafton County. It is part of the Western White Mountains. The mountain is named after Nathan Kinsman, who was an early resident of Easton, NH. This mountain, along with North Kinsman Mountain, are both considered 4,000 footers because there is more than 200 feet of topographic prominence between the two. Because it is the highest point between Franconia Notch and the Kinsman Notch, South Kinsman Mountain is the sixth most prominent mountain of the White Mountains. There is no views to look at on the summit of South Kinsman Mountain because trees are in the way. 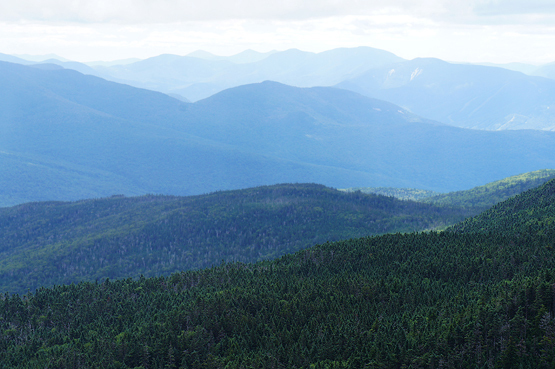 North Kinsman Mountain is a 4,293' (1,309 m) mountain in the Kinsman Range in Franconia, NH, Grafton County. It is part of the Western White Mountains. The mountain is named after Nathan Kinsman, who was an early resident of Easton, NH. This mountain, along with South Kinsman Mountain, are both considered 4,000 footers because there is more than 200 feet of topographic prominence between the two. There are spectacular 180 degree views off a huge boulder near the summit of North Kinsman Mountain overlooking Cannon Mountain, South Kinsman Mountain and the Franconia Ridge. 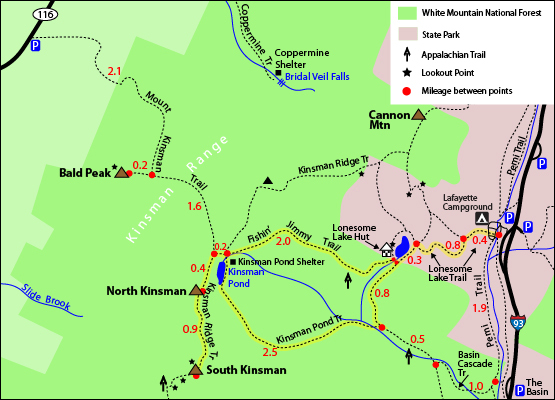 The trail map below shows how to get to the summit of North and South Kinsman Mountains. Begin at the Lafayette Place Parking Lot. Hike along the Lonesome Lake Trail for 0.4 miles until you reach a fork, where you will bare left to stay on the same trail for 0.8 miles. Hike along the Cascade Brook Trail around Lonesome Lake for 0.3 miles until you see a sign to switch over to the Fishin' Jimmy Trail. (You will see signs for the Lonesome Lake Hut here. Take a stop in if you wish!) Hike up the Fishin' Jimmy Trail for 2.2 miles. (crossing over the junction with the Kinsman Pond Trail.) Turn left onto the Kinsman Ridge Trail, which is also the Appalachian Trail, and hike for 0.4 miles until you reach the summit of North Kinsman Mountain. After enjoying the views on North Kinsman, continue hiking over the summit along the Kinsman Ridge Trail for 0.9 miles where you will reach the summit of South Kinsman Mountain. To head back tot he Lafayette Place parking lot, you can retrace your steps the same way you came up, or switch some of the trails up for fun by taking the Kinsman Pond Trail instead of the Fishin' Jimmy Trail. Then turn left to hike along the Cascade Brook Trail for 0.8 miles back to the Lonesome Lake area, and continue the last 1.5 miles the same way you hiked in. 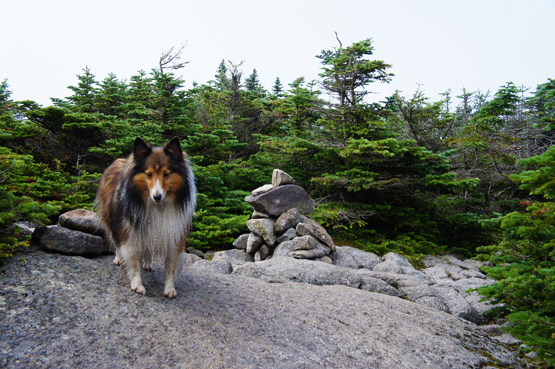 Rock cairn on the summit of Kinsman South Mountain on August 5, 2012. Incredible never-ending views from North Kinsman on August 5, 2012. The parking lot for the highlighted hike above is at the Lafayette Place Campground parking area. It is exit 34B off I-93. If you are coming from the South, you will need to turn left back onto I-93 South after taking exit 34B. Drive 2.1 miles on I-93 South then take the exit towards the Lafayette Place Campground / Railhead Parking. Merge onto the Recreational Trail. Turn left onto Lafayette Campground.